When properly applied, it is more effective than many local treatment methods in killing drywood termites [1, 2]. SF kills drywood termites, carpet beetles, clothes moth, cockroaches, bed bugs, rodents, etc. [3, 4]. Locating live drywood termites in a structure is always a challenge  but this doesn’t affect fumigation efficacy because SF will penetrate all wood members within the building. Like many other pesticides, exposure to SF can have adverse health effects on people and animals. For example, high concentrations of SF damaged kidneys, respiratory system, brain, and caused death in laboratory animals . Likewise, exposure to SF can cause death in humans . Permanent injury or death cases in humans caused by structural fumigations are generally very rare and are usually due to unauthorized entrance into the building for the purpose of burglary  or suicide  during treatment or insufficient aeration after treatments. At low concentrations, SF may have subclinical effects on neurobehavioral functions such as olfaction, dexterity, and memory in fumigation workers . SF is a strong greenhouse gas with atmospheric lifetime estimation of 36 years . Average atmospheric concentration growth rate: 5% per year (1978-2009) . 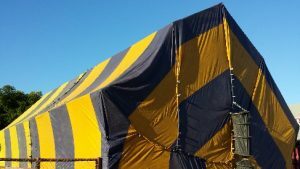 Pre-fumigation preparation, including evacuating people and pets, removing interior and exterior plants underneath tarps, as well as bagging food and drugs can be difficult. Other preparations: Shutting off natural gas and extinguishing all flames. Burglary cases are not uncommon. For example, 19 cases of burglary associated with structural fumigation happened just in Southeastern San Diego, CA between July 2015 and Feb 2016 . More and more, residents are hiring security guards to protect their property from burglary . If fumigation is not done in conjunction with exclusion and other preventative tactics, termites may re-infest the treated structure soon after fumigation has been completed. This is due to the lack of residual activity of SF. $1 to $3 per square foot which costs $1000-$3000 to treat a 1000 sq. ft. house  plus lodging cost during treatment and the potential cost of hiring security guards. Wood and non-wood material will retain and slowly release very low but detectable amounts of SF for up to 20 days following the aeration period . However, these concentrations are not known to cause any adverse short-term effects. Chronic or long-term effects of SF on humans and animals are not well studied. 1. Scheffrahn, R.H., N.-Y. Su, and P. Busey, Laboratory and field evaluations of selected chemical treatments for control of drywood termites (Isoptera: Kalotermitidae). Journal of economic entomology, 1997. 90(2): p. 492-502. 2. Lewis, V.R. and M.I. Haverty, Evaluation of six techniques for control of the western drywood termite (Isoptera: Kalotermitidae) in structures. Journal of economic entomology, 1996. 89(4): p. 922-934. 3. Products, D. Vikane product label. 2015. https://www3.epa.gov/pesticides/chem_search/ppls/001015-00078-20151230.pdf. 4. Su, N.-Y. and R.H. Scheffrahn, Efficacy of sulfuryl fluoride against four beetle pests of museums (Coleoptera: Dermestidae, Anobiidae). Journal of Economic Entomology, 1990. 83(3): p. 879-882. 5. Lewis, V.R. Final report: Research Proposal to the California Structural Pest Control Board for Structural Pest Control Research Assessment of Devices and Techniques for Improving Inspection and Evaluation of Treatments for Inaccessible Drywood Termite Infestations. . http://www.pestboard.ca.gov/howdoi/research/ucbfinal.pdf. 6. Eisenbrandt, D. and K. D NITSCHKE, Inhalation toxicity of sulfuryl fluoride in rats and rabbits. Toxicological Sciences, 1989. 12(3): p. 540-557. 7. Scheuerman, E.H., Suicide by exposure to sulfuryl fluoride. Journal of Forensic Science, 1986. 31(3): p. 1154-1158. 8. CBSSF Fremont Burglary Suspect Who Entered Fumigated Home Dies. http://sanfrancisco.cbslocal.com/2016/05/20/fremont-burglary-suspect-fumigated-home-dies/. 9. Calvert, G.M., et al., Health effects associated with sulfuryl fluoride and methyl bromide exposure among structural fumigation workers. American journal of public health, 1998. 88(12): p. 1774-1780. 10. Papadimitriou, V.C., et al., Experimental and theoretical study of the atmospheric chemistry and global warming potential of SO2F2. The Journal of Physical Chemistry A, 2008. 112(49): p. 12657-12666. 11. Mühle, J., et al., Sulfuryl fluoride in the global atmosphere. Journal of Geophysical Research: Atmospheres, 2009. 114(D5): p. 1-13. 12. Repard, P. Arrest in home fumigation burglary series. 2016. http://www.sandiegouniontribune.com/news/crime-courts-fire/sdut-house-fumigation-burglary-arrest-2016feb17-story.html. 13. FAUSTO, A. If you tent and fumigate your house, here’s how to beware of burglars. http://www.ocregister.com/articles/herrada-663611-homes-security.html. 14. How Much Does Home Fumigation Cost? , http://www.howmuchisit.org/home-fumigation-cost/. 15. Scheffrahn, R.H., et al., Desorption of residual sulfuryl fluoride from structural and household commodities by headspace analysis using gas chromatography. Bulletin of environmental contamination and toxicology, 1987. 39(5): p. 769-775.